If you read my earlier post, you know that Jen and I were planning to tackle the gigantic hot dog known as “The Big Unit” (named for 6′ 10″ baseball player Randy Johnson) at Alice Cooper’s Cooperstown restaurant in Phoenix. The dog was made famous by Adam Richman on Man vs Food, and one version bears his name (sort of). Well, the wait is over. We rolled into downtown Phoenix last Wednesday night and hit Cooperstown with our bellies rumbling and ready to be crammed full of food. 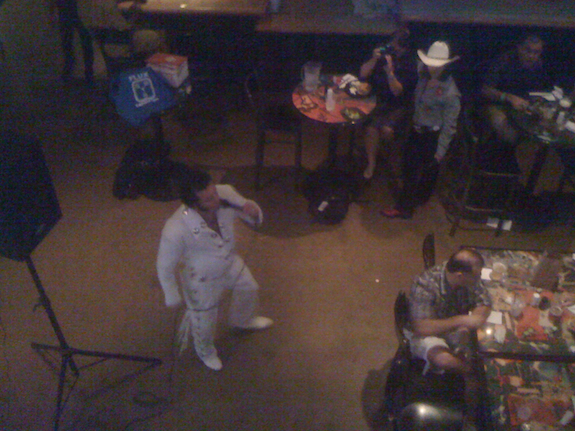 There was some kind of engineer conference in town and they were having an awards ceremony at the restaurant, so the place was overrun with dorky-dorks making a lot of racket, and they even brought along their own Elvis impersonator. 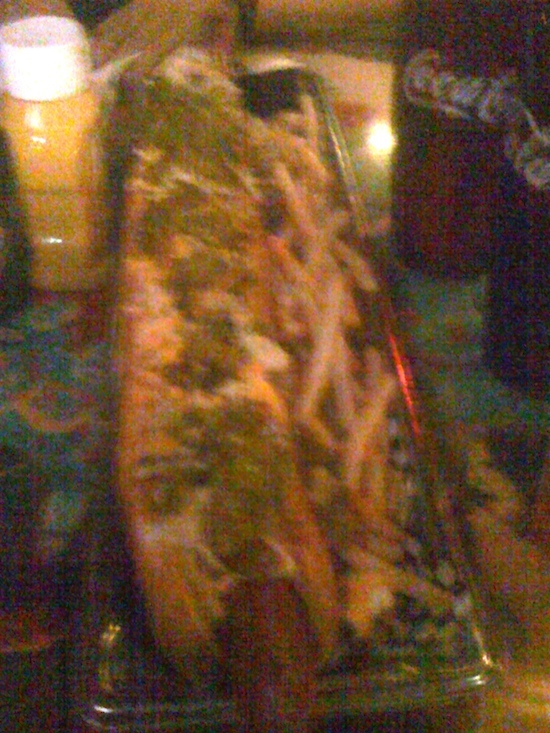 We ordered “Adam Richmond’s (sic) Bases Loaded Big Unit,” a 22-inch hot dog slathered with chili, relish, jalapenos, cheese and onions (hold the tomatoes, since Jen doesn’t like ’em). The place was so dark I couldn’t get a decent photo of the dog, so I’m delivering unto you a truly terrible photo of the thing, tweaked in iPhoto to bring out the colors of this wondrous beast. The dog was definitely tasty but could have used more chili — it almost didn’t seem slathered with enough crap, if you can believe it. We finished it off quickly and were on our way… but I have to be honest, that damn thing went through my guts like a threshing machine. My insides were yowling and growling all night long — and I think it’s best if I leave the tales of the aftermath at that. I only wish I’d gotten photos of the Cheddar Butter-Burger with Bacon and chili cheese fries from Culver’s.